Life in Northwest Arkansas was pretty much one color the last few months. Since December 2013, we’ve had either an ice or snow storm every month through March. The glistening white stuff is both troublesome and breathtaking all at the same time. As much as it makes traveling difficult, especially for someone with a disability, it truly is so peaceful and pretty. It’s amazing to me how something that is so utterly monochromatic could be so beautiful. Each weather system brought different elements from lots of snow in the first storm (well six inches is a lot for us down in the South!) to the freezing rain/sleet/snow combo we had in March. In recent weeks however, the world has started to change and many of us are excited! Colorful plants are popping out, grass is coming back to life and the sun is shining. Even the angry storm clouds have their own beauty. Oh, and there have been days warm enough to be outside to enjoy it all! First let’s review some of my favorite (or the most telling) photos from this past winter. This is pretty much my favorite picture of all of them. Flower loves the snow! This was taken December 6, 2013. Check out that snow! 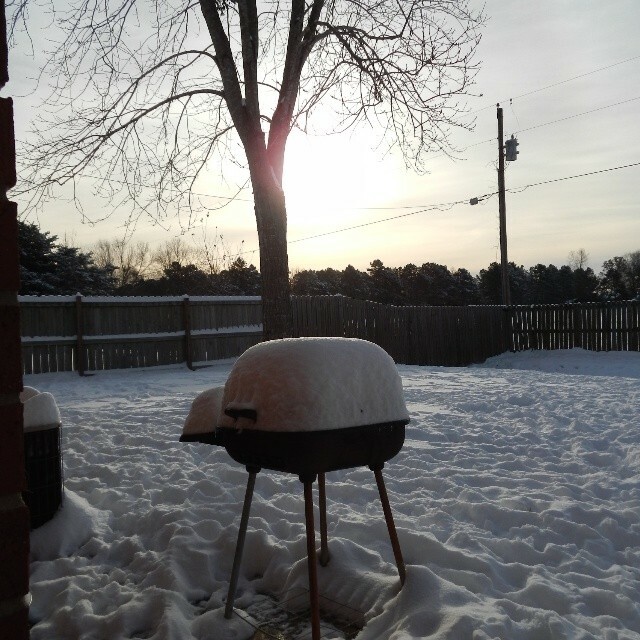 This was taken the morning of December 7, 2013. I think we ended up with 6 inches. You can see the depth on our grill. The rest of the yard was pretty trampled by happy puppy dogs. That was the storm that had all of Northwest Arkansas up in arms because the roads were very poorly managed. I think I was not able to get out for 8 days after this (I have to be extra careful). The first week of January brought more snow but not as much as other storms in the winter. I think we got a couple inches then. February’s storm packed a little more punch if I remember correctly. Colby found the perfect spot next to our garage where the snow had melted. 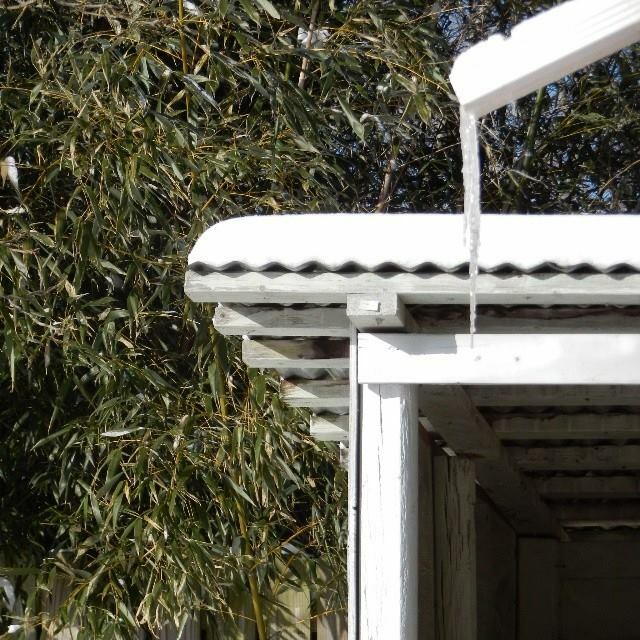 It kept warming up and refreezing, thus creating cool looking icicles from our drain spouts. February 2014. Do you want to build a snowman? I named this yard decoration Olaf. 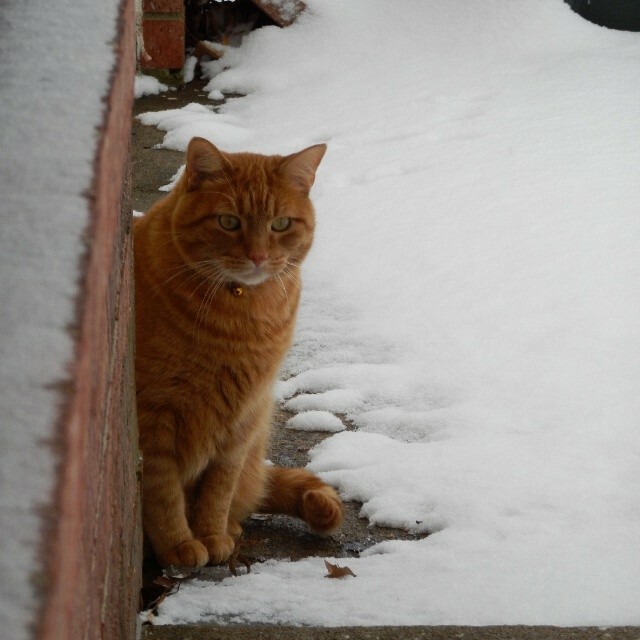 I got this cute picture of him in real snow on an evening in earlyFebruary 2014. Our final (I hope!) storm came in March. It put down a lot of sleet and freezing rain then snow then freezing rain on top. That made the snow pretty hard to the point that our dogs didn’t even break through. 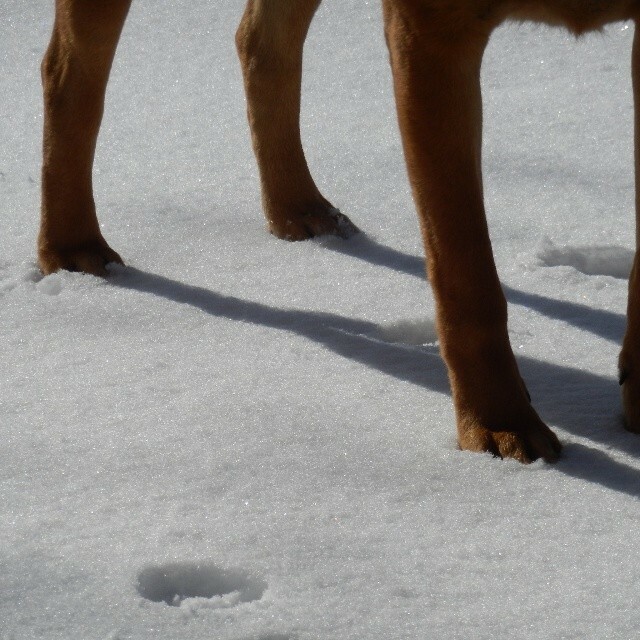 In this photo you can see the paw print that was made before the final layer of freezing rain hardened every thing. The dog (Jazzy) didn’t sink after that! 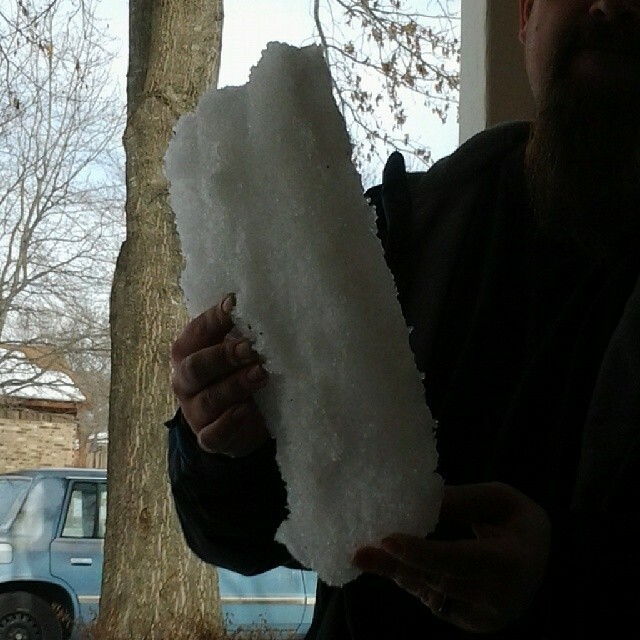 This one block of ice came from our driveway. March 2014. Let’s take a look at some color! 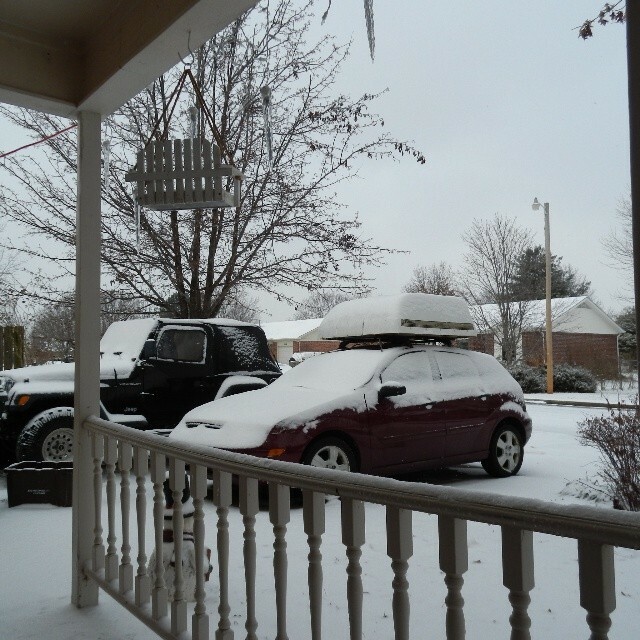 These are some more recent views in Northwest Arkansas. 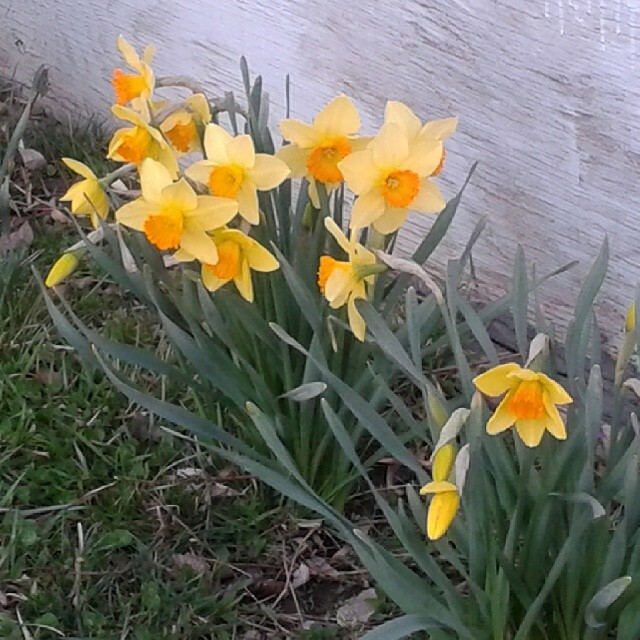 These daffodils come up next to our shed in the backyard. So pretty! 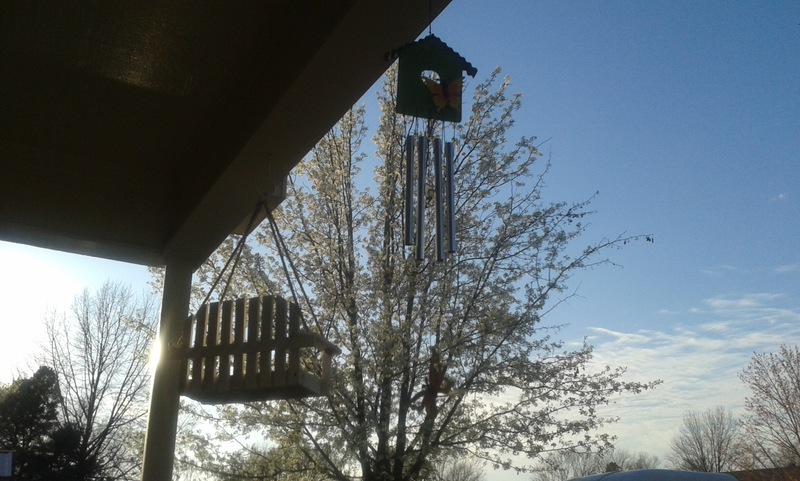 You can’t see them well, but we now have a butterfly wind chime and a bird feeder that looks like a porch swing hanging from our porch. 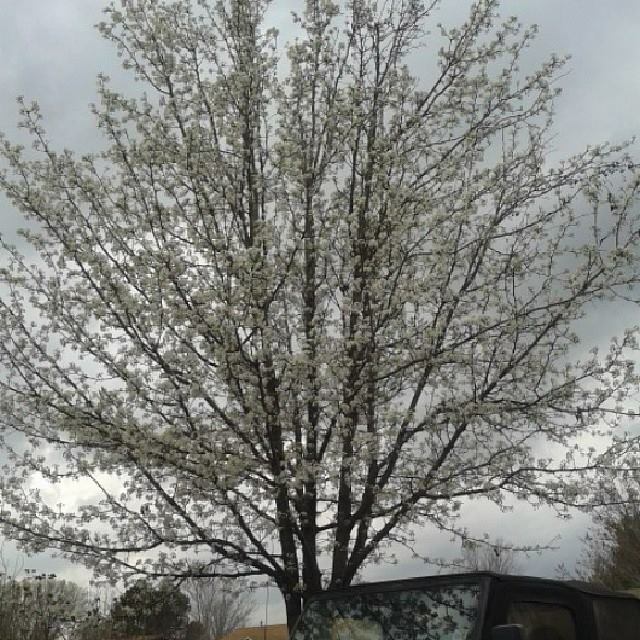 Bradford Pears are kind of annoying trees but they are pretty when they bloom! 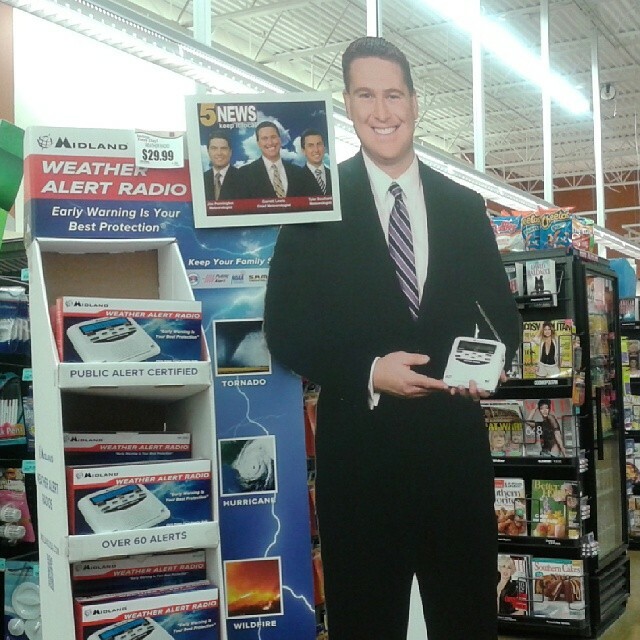 You know it’s spring when you see the giant cutout of a local meteorologist urging you to get a weather radio! The above picture is of a recent storm rolling in. 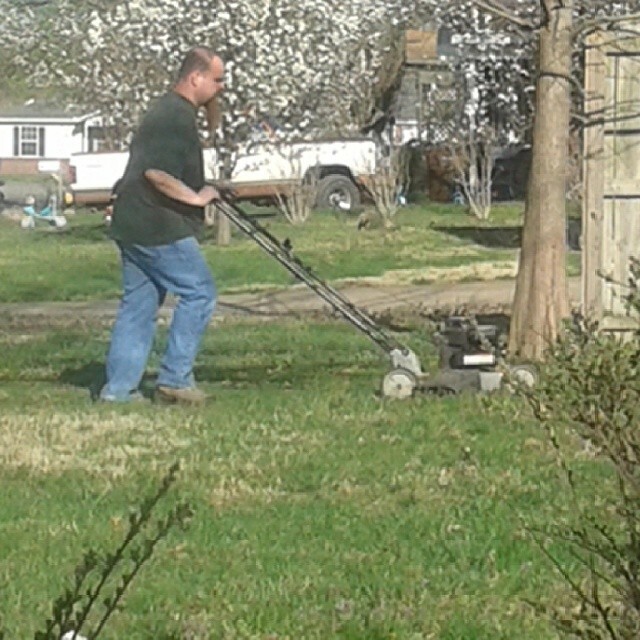 It wouldn’t be spring without yard work! A view of our front porch. 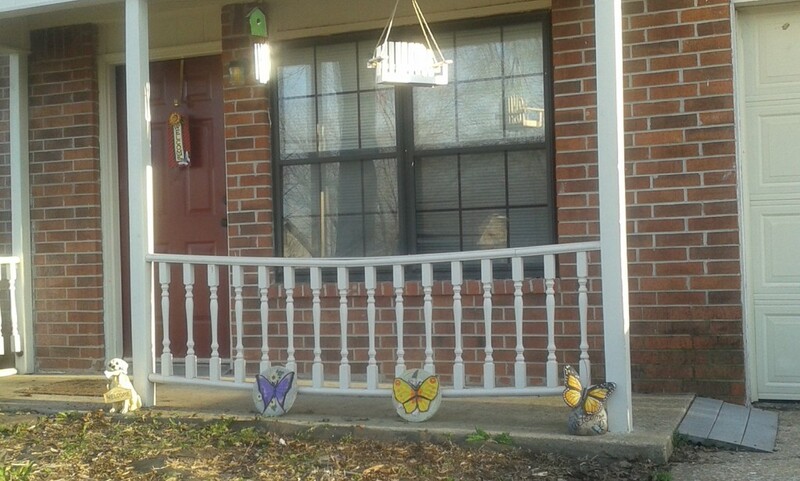 Yes, that’s a butterfly wind chime, a butterfly on our door hanging, and three butterfly garden sculpture thingies. I like butterflies but agree I need to find other bugs to decorate! I’m thinking dragonflies and ladybugs. Wow! Amazing cat’s eye color! Is it partly affected by the reflection from the snow or is it like that all the time? I love winter and snow and ice, but do not have to get out into it except to thaw my hennies’ water every morning. All five of them wake up thirsty! Oh, and I spread bird seed if the groundcover is too deep. My favorites though, are the second one–the golden moment on the trampled back yard; and that sultry shot of the storm a-brewin’. I love all weather! I’m anxiously awaiting for Winter to finally say goodbye. 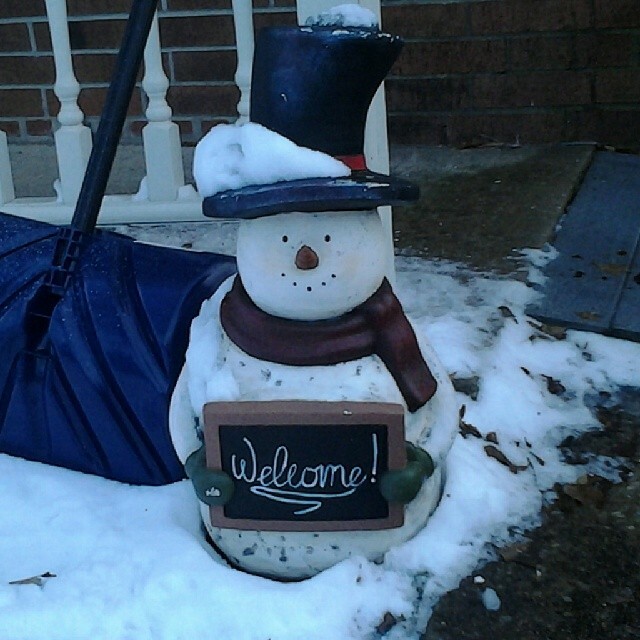 I thought we were in the clear but then a storm hit last night with sleet… ugh! Thanks for sharing these pretty pics with us! Spring is so beautiful isn’t it? Winter too, I agree. There’s something so calming and beautiful about snowflakes falling outside, especially when you’re warm and cozy inside. 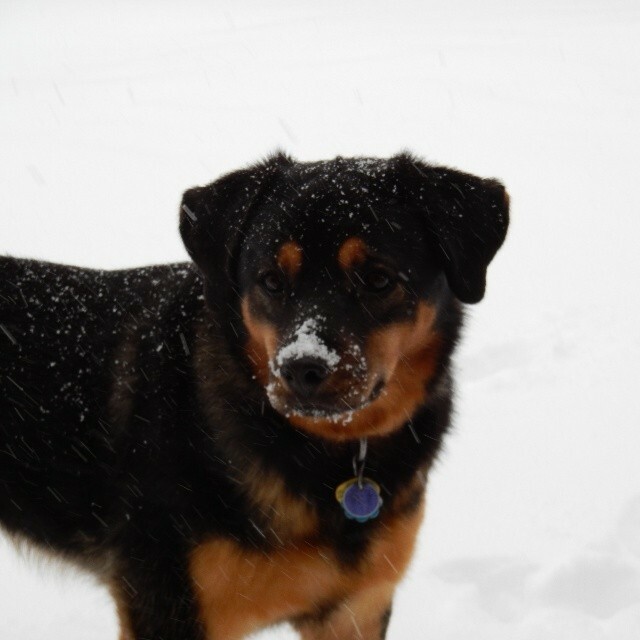 Colby is cracking me up in that snow photo…. just like Harold. Skip around the snow and ice to find the melted spots to step or sit in. lol So cute!